K Rend not only offers a high quality, durable finish with great natural looking results it also gives a wide choice of textured finishes to choose from. Richard Williams Builder’s Merchants in North Wales are the main K Rend suppliers for the region and know just how popular K Rend has become. One of the reasons builders love it is that it is easy to apply. There are different techniques to get the best results for each texture option but all are relatively straight forward. Naturally you need to start with a base coat before you begin your application technique for the roughcast texture. The thickness of your base coat may vary depending on the product you are using so always be sure to read the specification on the product container. Take care to straighten with a darby or straight edge so this level is uniform ready for the next coat. Leave to dry for about a day. Then apply a single coat of dash receiver about 6mm thick. Allow it to firm but not set. To achieve a uniform colour in roughcast always mix enough for the area to be rendered into a bath or box. Do not add any further water into the gauging box on the scaffold. Through the Roughcast onto the dash receiver layer while it is still green using a dashing spoon. Refrain from going over semi missed areas with the spoon as this will lead to intensity of colour. Protect from water while drying. There is a spray applicator available for purchase with this product. 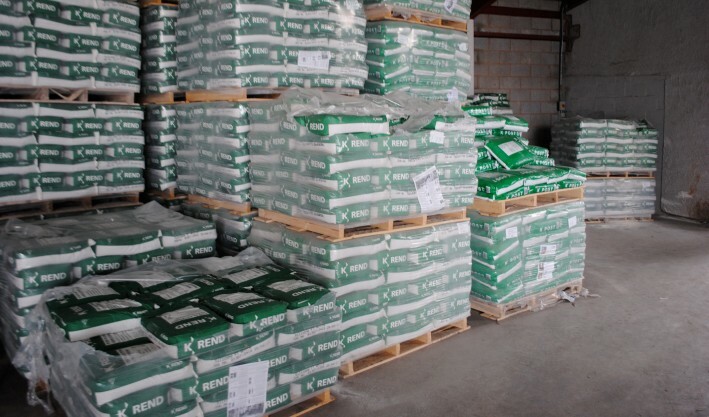 All the K Rend products deliver a stunning finish for your exterior render and the K Rend brand is synonymous with quality. Contact your local North Wales K Rend suppliers Richard Williams for more information. Fitting flooring and wall tiles are two tasks that are commonly encountered by everyone at one time or another. When it does, it is common to call up a local businesses to have them complete the job for you. Little did you know, with a little bit of research, gathering of the right equipment and motivation towards the job, those with little DIY experience can have a good go at fitting the floor and tiles of their dreams. These tasks may be harder for some, so you will have to judge your confidence and ability, as only you know if you are capable, but for those ready for the challenge, we have devised an easy to follow ‘how to’ guide to take you through the steps of fitting both flooring and tiles. It is important that you take accurate readings as it will influence your whole project and the outcome. Measure the length of the area that you are intending to tile, and then divide it by the length of the tile you are going to use. Measure the width of the area you will cover and then divide it by the width of the tile. 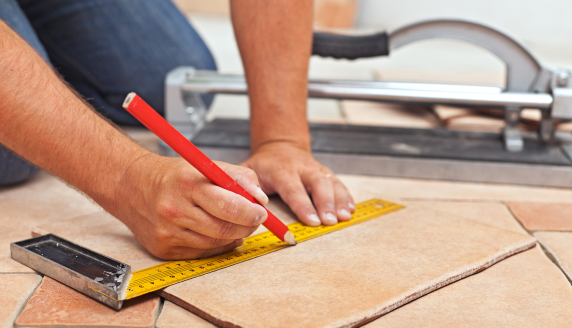 Round up the number of tiles for length and width, then multiply the two results to find out how many tiles you are going to need to complete your job. To allow for any breakages or poor cuts, add an extra 5% for wall tiles and 10% for flooring. Planning will allow you to avoid uneven spacing and poorly aligned rows of tiles. Use a consistently sized spacer between tiles to keep things evenly arranged. Such objects as a matchstick or plastic spacer will do this job nicely, allowing you to successfully grout later on. The most visible row of tiles will be the one along your room entrance, so this can be your starting point. Take a pencil and draw a line vertical to the main entrance. Lay dry tiles along the line to the other side of the room and fill the small section with a 1 inch thick piece of wood the signal the small gap that will be left. You then lay against this block. Bear in mind that tiling a floor will raise the level, so consider this in regards to your door, which may need its length changing. Mark up one wall at a time, and ensure horizontal lines match up by creating a base line running around all your walls. Take into account the items on the walls, such as window sills, door heads, bath tops and work tops. Think about the area you are tiling, and which side the full tile should be placed on. For example, if you’re tiling the bottom half of the wall, mis-cuts are better on the bottom, by the floor. If you are working around a door frame or window, think about the effect of starting points, as it is best to have even tiles on either side of your window or door, consider the effect at either end of the walls. Measure the height of the wall you are tiling and divide it by two. Mark this height on the wall. Using a spirit level, draw a horizontal line across the wall, marking out what will be the bottom of the lowest row of whole tiles. Secure a batten to the wall, which will signal the base of which you will start tiling from. To ensure you are measuring accurately, and tiles stay vertical, use a gauge rod to measure and mark at one metre intervals. You will likely need to do some modifying to tiles to make them fit your area in corners and bottoms. Place tiles upside down so it overhangs the other tiles and touches the wall. Mark tile on the bottom where It overlaps, taking into account room for grouting, and then proceed to the cutting stage. -Hold the straight edge on the cut line and run the cutter along the surface, score the surface. – Place small wooden batten on the floor and hold a tile over it, ensuring that scored lines are in line with the batten, apply pressure to the sile one each side to snap the tile. – If you are creating a curved or L-shaped tile, score the surface on its line where you will trim, and remove the excess with pliers in small, carefully manoeuvred pieces. Ensure the tile is dry and clean. Ceramic tiles can be laid on concrete and timber flooring however you need to screw down a layer of exterior grade plywood to the floor. When the concrete is uneven you can apply a self-levelling compound and let it dry overnight. If there are any ridges left over, you should smooth them off with a medium sand paper. The type of adhesive used will depend on where the tiles are going to be laid. You’ll require waterproof adhesives around such areas of baths and toilets. It is normally advised to spread your adhesives on the area, until you are doing the corners, where you back of tiles. Before any laying or fixing takes place, check that your tiles are consistent and there are no colour variations. Fix ceramic tiles into place using adhesive area, ensuring that consistent spacing is used. Check that each of them is kept level with one another, with a spirit level always proving a useful tool for this. To make a tile lower, hammer it through a block of wood to force it down a touch. On the contrary if it is too low, pull it up, and reapply the adhesive. Allow sufficient time for setting. Ensure the first tile is fixed against horizontal batten running along the bottom of the area to be tiled, before lining up the tiles side with the vertical mark you set as a starting point. For the first column of tiles, it might be helpful to fix a vertical batten in place. Press down the tile against the adhesive, ensuring it is flat and fixed, before allowing grouting space. Ensure each tile is relative to both the wall and previous tile. Before removing the batten, ensure that the tiles have set in position, or you risk movement. Finally you can remove the batten and fill any remaining spaces with your cut border lines. There are a range of different grout substances, but remember that you should leave tiles for 24 hours before you proceed to grouting. Use a rubber edged squeegee at 45 degree and to fit spaces with grout. Work on small areas at a time, so it doesn’t end up drying before you have it in its final place. To smooth grout in the joins run a piece of dowel over each join, removing any excess before it dries up. Wipe off any grout when you are finished and remove the thin film off of the tiles. Clean the floor every day for the first few days to ensure that the grout will be harder wearing through the rest of its life.